SymbolEditor is a program that can create libraries of QPainterPath objects with hints on how to render them. 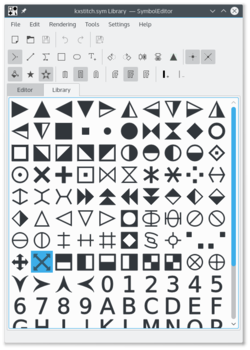 It was originally designed to create symbol libraries for the KXStitch application, but other applications using similar functionality could also make use of them. For information on the file format see this page. 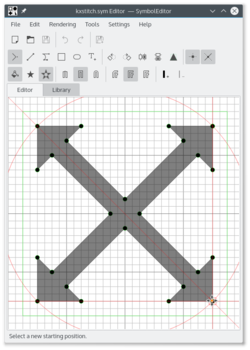 There are a number of tools to aid the designing of symbols, including lines, bezier curves, rectangle and ellipse. Text characters can be selected from any font and the symbols can be mirrored or rotated. Symbols can be filled or unfilled, the line end type and joining style can be changed and the line thickness can be varied. For more information see the Qt QPainterPath documentation. A user manual is available here. RPMs are available for OpenSuSE, Fedora and CentOS on the OpenSuSE Build Service. Development code is available here. 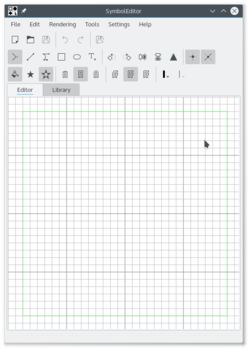 Version 1.5.0 source code for KDE 4 is available here. Version 2.0.0 source code for KF5 is available here. This page was last modified on 17 November 2015, at 06:25. Content is available under Creative Commons License SA 4.0 unless otherwise noted.